Extension ladders are one of the essential tools in the equipment of every homeowner. Whether you want to fix a ceiling fan, reach a floodlight, paint walls or wash every window in your house, you need a ladder that can extend to a proper height. However, this useful tool has to be stable and safe enough for you to climb on it. Safety always comes first, so normally you’ll want a stable and safe ladder that you can use for all your home repairs and if you work in such an industry. There are various ways for you to make sure that extension ladders are safe and durable, starting with high-quality materials and sturdy features such as locks, rungs, bolts and other. Searching for a perfect ladder isn’t as easy as it seems at the first sight, especially considering all those different products that pop up on the market every second. That’s why we have done a research with only one goal: to find the best 10 extension ladders out there. We wanted to help you in the tiresome process of choosing the right kind of product for your personal needs. Our list should guide you and hopefully, you’ll find just the right extension ladders among our best picks! Louisville Ladder is a well-known manufacturer whose ladders are very popular and praised among users. Our number one pick is a model named FE3228 Fiberglass Multi-section Extension Ladder. It’s one of the first-class ladders that provide complete confidence during use and help you with performing your tasks effortlessly. The ladder is available in many different sizes: 16, 20, 24, 28, 32, 36 and 40 ft. We gave our full attention to the 24 ft model which can support 300 lbs. It measures 8 x 19 x 148 inches and has some first-class features. Firstly, the ladder has serrated rungs that prevent slippage during wet weather, and non-conductive fiberglass D-rung rails that provide safe working near electricity. What makes it even safer is a heavy-duty plated steel shoe with thick rubber treads. You’ll be able to use this ladder near electricity without any issues, knowing that you are completely safe! Additionally, its anti-slip rungs are especially useful during rain time – they keep both you and your ladder protected. 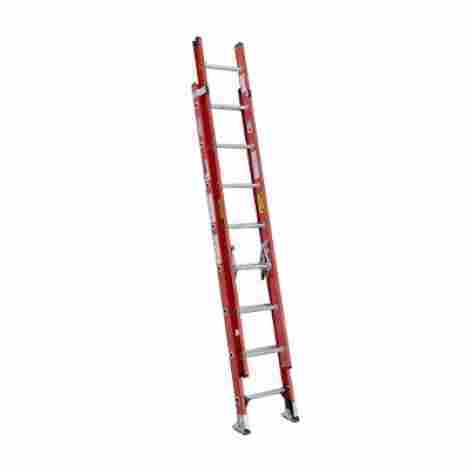 The ladder is quite heavy (54 lbs) due to sturdy materials that also make it durable and stable. However, that can make a hassle for people who don’t have big garages to store the ladder, and it can be quite heavy for carrying around. Other than that, we couldn’t find any big drawbacks. The ladder comes with quick latch system, safety rope, and pulley, which is a great supplement especially when we take into account that many ladders don’t include safety equipment. Louisville FE3228 is a heavy-duty ladder that can endure a lot and provide maximum safety during use. It’s perfect for electrical, utility, construction and residential jobs. The ladder is on the expensive side, but considering its versatility and outstanding characteristics, almost every user thinks that it’s worth of every penny. If you want a heavy-duty ladder that will give you a feeling of comfort and safety during every climb for window cleaning, roof tile replacing and other demanding tasks, TB Davies might be the right choice for you! This ladder is made out of quality materials that make it sturdy and durable, giving you the opportunity to easily perform any repairs and cleanups at big heights. 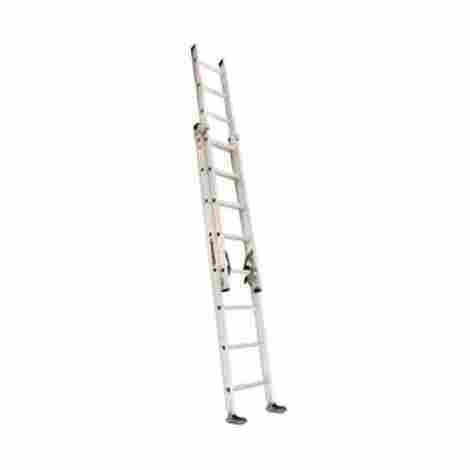 The ladder has 9.8 ft and extends up to 23 ft giving you around 19.7 ft of working height. The height of the ladder is fully adjustable, so you can adapt it to your needs. Furthermore, the manufacturer made sure to offer you a choice, making several ladder heights available. Also, the ladder can hold up to 320 lbs – more than enough for you and your toolbox altogether. The unique D-shaped rungs are designed to provide stability to your feet even during extended use. They are wider than usual, providing a more secure and stable platform for you to stand on. Additionally, the ladder comes with various accessories such as roof hook kits, stand-offs, ladder mats, and bases. The only downside is its weight – it weighs around 46 pounds. You’ll have some difficulties with moving it around, and not to mention all the hassle with storing this bulky ladder. However, this weight will keep you safe and stable on any height. TB Davies ladder makes possible reaching all elevated places while still providing a comfortable and safe feeling. Sturdy ladders like this are made to help you deal with all demanding and dangerous tasks on big heights with great ease – you’ll be able to change roof tiles and repair windows in no time. 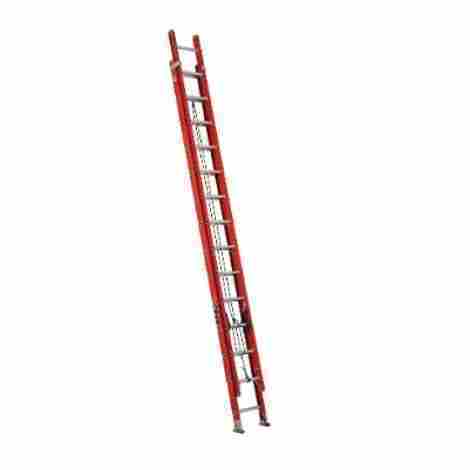 Lastly, it might come as surprising, but this ladder is very well-priced. You will make it a part of your home and work equipment in no time, and you’ll also get a 3-year warranty. Werner ladder is an excellent option whether you need it for home repairs, facilities maintenance or residential construction. The rails are made of fiberglass so the ladder can also be safely used near electricity. This versatile ladder comes with several high-quality features and some great accessories that you should know about – keep reading if you want to find out more! 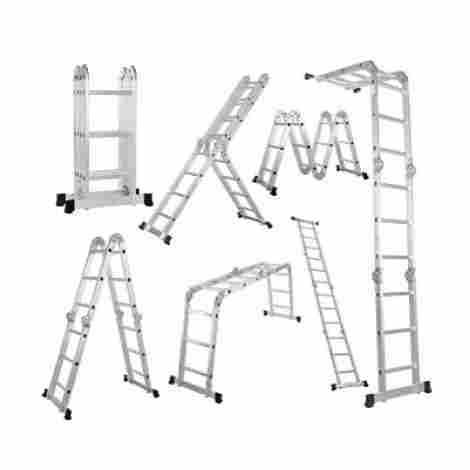 You can choose a ladder from 5 available sizes: 16, 20, 24, 28, 32 ft. The one that we have chosen for evaluation comes in 6.5 x 19.5 x 101.5 inches. The ladder can carry 300 lbs which is more than enough for you, your tool and materials. We already mentioned that it has non-conductive fiberglass side rails, but we shouldn’t forget a couple more useful features. For example, there are slip-resistant D-rungs and ALFLO rung joints that keep the ladder from twisting during the use. That way, the ladder provides safe steps for you to climb on, and it lasts longer. The ladder weighs 35 pounds. You can see that Werner is a lighter model than previously reviewed ladders. It extends easily and stays on its place thanks to smoothly operating spring locks. Also, each ladder utilizes a durable rope and a pulley. The base and fly sections separate simply if you want to use the base section as a single ladder. This is one of its most important features because many customers are searching for an extension ladder that can be safely divided into two parts and joined afterward. Lastly, we can summarize this review by saying that Werner ladder is a valuable but pricey product. Considering its versatility and many safety features, you surely get what you pay for, but some people might find it overpriced. Here we have another extension ladder from Louisville. We already mentioned that this manufacturer does a great job when it comes to producing high-quality ladders, and this one is no exception! It offers first-class features and some accessories that will help you perform any task at any height safely and with great ease. You can choose your ladder from 7 available sizes. They can all carry 300 lbs including user, tool and material weight. The side rails are made from sturdy and lightweight material that Louisville calls I-beam design. Along with that, the ladder has quick-latch rung locks that keep it safe when extended. There are also swivel safety shoes for uneven surfaces and metal slide guides that prevent separation of two extension pieces. Overall, the manufacturer has put in some serious effort to provide all these features and make the ladder extra safe to use. 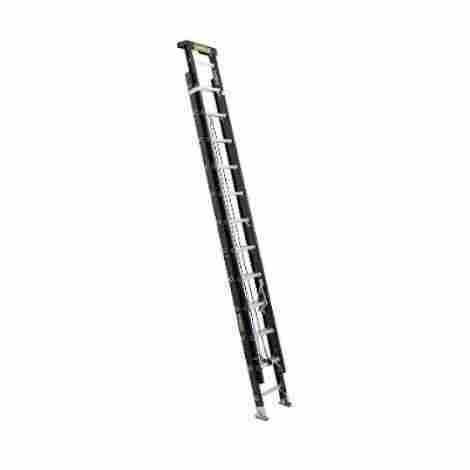 Users mostly praise this Louisville ladder because of its lightweight design. You can easily place, move and extend the ladder all by yourself. Not to mention that it’s easy to store, unlike other bulky ladders that can’t even fold down. The only downside you’ll surely find with Louisville are sharp edges. You’ll want to buy rubber and a cap for shoes if you want full protection during the use. Other than that, you won’t have any major issues with this durable and strong ladder. Louisville Ladder is undoubtedly one of the best ladders on the market and its price also reflects that. Most users praise it for its high-quality features and useful accessories, considering the price reasonable for all the value that it provides. Therefore, if you want this long-lasting and secure tool, all you have to do is to spend a few more bucks! 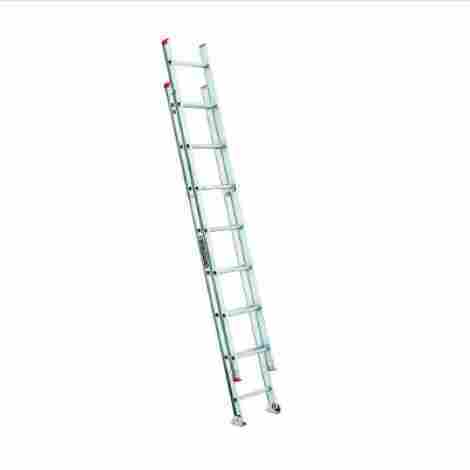 This Werner ladder model is designed for small to medium demanding jobs around your household. It’s ideal for home repairs and facility maintenance, providing a secure climb and a comfortable feeling during use. Keep reading if you want to find out why this ladder might be just the perfect choice for you! The ladder measures 144 x 17 x 6 inches and it can carry 225 lbs. It has traction tred D-rungs that are slip-resistant and interlocking side rails. There are also sturdy spring-loaded locks for more protection. Shoes of the ladder rest flat or they are in spur position with SHU-LOK feature, and they have caps for surface protection. Let’s not forget an ALFLO rung joint that reduces any ladder twisting during use. All these features contribute to the overall stability and safety of the ladder. You’ll be able to lock the ladder in its place, extend it and lock extension part effortlessly, and confidently climb at any height. The ladder weighs around 35 pounds, it’s lightweight enough to provide easy transport and carrying from site to site, not to mention that it demands less storing space. It’s made from durable and stable aluminum that’s also easy to set up. This gives a Werner ladder quite advantage over many bulky ladders on the market. Lastly, the ladder extends quite easy because of interlocking side rails, spring-loaded locks, and smooth-operating pulleys. We had a chance to introduce you with Werner ladder earlier on our list, so you already have an idea about the high-quality of the products that come from this manufacturer. However, this ladder is quite expensive. Those who have some extra money to spend on a new part of their tool equipment can’t go wrong with Werner, but those who are on a budget might want to skip this expensive ladder and search for a more affordable option. If you need a compact ladder that you can carry around easily while performing different household tasks such as changing light bulbs, cleaning windows, painting walls and many others, Lifewit ladder is just what you need! It’s a versatile tool that easily transforms into 4 different types of ladders for providing maximum support and protection during work. The ladder measures 41.3 x 17.7 x 55 inches, having 12 rectangular blocks (17.7 x 13.8 x 13.8 inches each). It can withstand a maximum weight of 330 lbs. The ladder transforms into 4 different positions (step ladder, straight ladder, stand-off ladder, and scaffold position) all adapting to all possible situations you may need it in. You can use it outside for climbing to hard-to-reach areas, or inside the house if you have walls to paint or light bulbs to change. You can even use it as a bookshelf or for tool disposal. The ladder is made from durable and rustproof aluminum that’s also lightweight and therefore, easy to transport and store. It has multi-position operating hinges, automatic safety locks, and stabilizer bars with rubber paddings for the maximum level of protection during the use. It has plastic doors and metal rungs that can be easily opened and closed. However, there were some users that had issues with the assembling part, so watch your fingers just in case. What’s going to surprise you the most is an attractive price of Lifewit ladder. You can get a versatile tool that will help you deal with all kinds of stuff around your home at a great price! Here we have another Werner useful and quality extension ladder that can be used for various purposes. It’s one of the compactly designed ladders that will provide maximum protection and help you achieve high-efficiency with household repairs such as replacing bulbs, window cleaning, repairing electrical issues and many others. 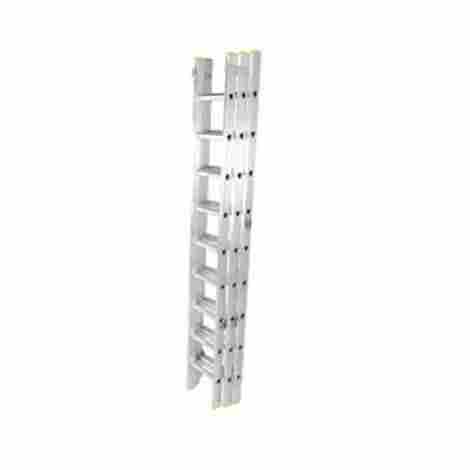 The manufacturer offers 3 sizes of this ladder: 16, 20 and 28 ft. They can all support a weight of 200 lbs – load capacity should be a bit higher, but it’s quite good for a compact ladder. We picked the smallest one that comes in 5.8 x 48.6 x 18.4 inches and weighs 17.3 lbs. It also collapses down into 96 inches. When it comes to utility and overall quality, the ladder has slip-resistant D-rungs and anti-slip pads on steps. Lastly, it’s important to mention that the ladder is made from fiberglass and therefore safe to use near electricity. As we already mentioned, this ladder weighs 17.3 lbs which makes it highly portable and easy to store. Werner brags about the easy and tools-free installation of its ladders. The same applies to this model. You can carry it around wherever your tasks lead you and simply fold them into adequate position that won’t take too much free space. However, as we said earlier, keep in mind that this ladder is not suitable for all heights. If you need a ladder that will extend more and give you the necessary stability on any height, this compact ladder is not for you. Overall, Werner D1116-2 provides excellent value for money. 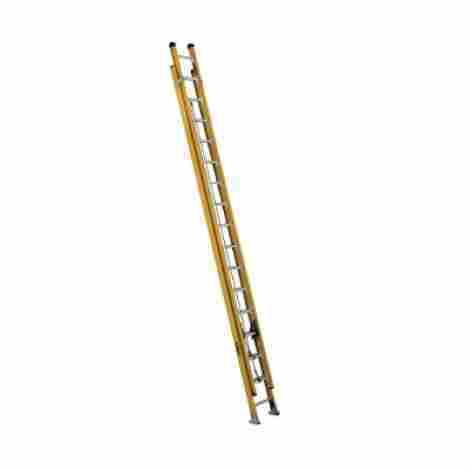 Although it’s not suitable for heavy-duty use, this ladder is a reasonably priced tool that will help you to reach all elevated and hard-to-reach areas with great ease. After all, every handyperson needs a compact ladder in their household tool equipment! Dewalt offers several differently sized ladders, and we present you the compactly designed one – a perfect choice for DIY enthusiasts and handypersons that want to do all house repairs by themselves. Dewalt added some unique and useful features to this ladder, so keep reading our in-depth review if you want to find out their purpose and overall quality of this great product. The ladder measures 103 x 19 x7 inches and it can carry up to 300 lbs. A key feature of the Dewalt extension ladder is the top, designed to provide a working surface when you’re on the ladder. It includes a hardware tray, drill and tool slots, and it has a rubber side to prevent scratches of the working surfaces. The ladder’s aluminum shoes are made to provide more stability and support along with non-conductive rails covered with a polyester veil. That way, the final result is a durable and long lasting ladder. With only 31 pounds Dewalt ladder is very lightweight and highly portable. There’s a nylon rope that can be used for easy extension and better support when you want to fold down the ladder for easier storage. The rung locks with quick latch are there to provide even safer climbing. Keep in mind that many customers complained about other sizes of this ladder being too heavy and not so portable. Dewalt is known for producing high-quality tools and this ladder is not an exception. However, this product is very expensive for a compactly designed ladder, so those who are on the limited budget might have to search for other options. We couldn’t overlook this compactly designed ladder from Louisville. It’s one of the ladders that every house owner needs in its tool equipment. Whether you want to replace a bulb, to reach high areas for quick cleanup or to perform simple repairs, you’ll need this kind of ladder! Louisville ladder comes in 103 x 19 x 7 inches, and it weighs only 8 pounds! It can carry up to 200 lbs including user's and tools’ weight. It has mar-resistant shoes and O-shaped rungs. Overall, the ladder meets all safety requirements and standards, and you can use it without any worries! The ladder is made from aluminum which makes it sturdy and durable yet lightweight. You’ll be able to carry it around with great ease, not to mention that you won’t have any storing issues. This Louisville compactly designed ladder has many great features but the best part is its attractive price! If you want to make this ladder a part of your tool equipment, you can do it without any hesitation because Louisville will be easy on your pocketbook! Here we have a heavy-duty Dewalt ladder that can help you with different tasks at any heights. 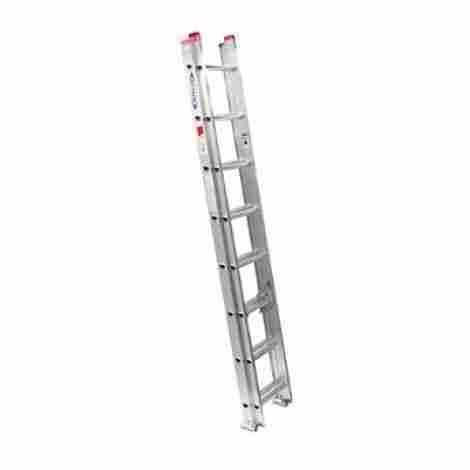 This ladder provides enough stability and comfort for you to use it confidently for an extended period of time. The ladder comes in 5 different sizes and they can all hold up to 300 pounds. It has an aluminum grip that provides easy handling and rubber caps on the bottom for surface protection. Also, the aluminum and steel shoes are specially designed to provide the maximum level of stability and support. Lastly, we shouldn’t forget about non-conductive rails covered with a polyester veil for more durability. We should warn you about possible issues with this ladder’s weight. You may find it too heavy to be easily moved around or simply stored. However, the weight adds to the entire ladder’s stability and it also makes it suitable for more demanding tasks. This ladder is a perfect choice for those who need a bigger-sized ladder that can provide more stability and safety for demanding tasks. However, keep in mind that you’ll have to spend some extra money on it because Dewalt ladders are very expensive! First things first, safety! There’s nothing more important than your safety and using extension ladders often seems like a silly thing to do. They do look rather flimsy and unstable, but the truth is all the opposite. Yes, they can be dangerous, but not if you’ve taken all measures of precaution and protection during use. Of course, ladders should be made from stable and durable materials, and they need to have some accessories that provide stability and maximum level of protection. That was the first and most important factor in our criteria. We chose the best ladders that we could find in the market, and all of them offer safety every step of the way, so we assigned points according to additional features such as safety ropes, pulleys, rung locks and other. You won’t be choosing your ladders according to your fence paint, and you probably won’t try to match it to any other piece of your equipment for that matter. What we think when we say ladder’s design is the way in which rungs, side rails, shoes, and other ladder’s parts are made. They can be designed to provide a comfortable feeling during extended use, to fold down for easy storage, to have a simple locking and installation system – all of this things can make your life easier but they also contribute to ladder stability and safety. Therefore, the design of every ladder on our list was a very important factor in the evaluation. As you probably know by now, the heavy-duty ladders cost more than small ones that can’t extend or endure a lot of weight. If you need a bigger ladder you don’t have much choice, you’ll probably have to spend a few more bucks to get it. However, the price always depends on many factors and you can still find the budget products that are a real steal! We tried to rank the ladders on our list according to their price but the value that you can get of the purchase was also an important concern. There are a few things that you should consider before you make your final decision and purchase the extension ladder for yourself. You can always follow the criteria we used for the evaluation of the best extension ladders, it will definitely help you to determine what to look for in very ladder, but you should also consider your personal requirements. How high ladders do you need? You should ask yourself for what purpose do you need an extension ladder. If you can make a count of most tasks and situations where you’ll need an extension ladder, you’ll be able to determine which size you need. There are many different sizes of extension ladders, and you don’t want to end up with the wrong size that can’t fulfill your needs. For example, the smaller ladder can’t hold up to any weight and it can’t be suitable for heavy-duty tasks. On the other hand, big ladders are heavier and harder to store, so if you don’t need a big extension you don’t want all the hassle that comes with it. It may seem sometimes that ladders can endure more weight than the manufacturer states in the product’s description, but there’s a good reason why this kind of limitation exists. If you exceed the weight limit you disturb the overall safety and stability of the ladder. Not only that it can break under pressure (it’s actually less likely that this happens), but it can rotate unsafely, bend down and overall be flimsy. That’s why you need to first determine what amount of weight will your ladder carry on a daily basis, including your tools and material. It’s better to look for a bigger ladder that can endure more than to take smaller and accidentally exceed the weight limitation. There’s another important factor you should take into consideration before you buy an extension ladder. Where will you use it? You want to be sure that your ladders are useful and safe. If you need to perform simple repair and tasks such as replacing lightbulbs, painting room walls and reaching windows for cleaning, you can go with a small ladder that you can easily store. On the other hand, if you need a ladder for changing the roof tile or facilities maintenance, you’ll need a heavy-duty one that can endure a lot and still feel safe underneath you. Additionally, you should choose the ladder according to its material – for example, if you plan to use it near electrical wires, you should go with the one made from fiberglass, and avoid the ones made from aluminum. Q: Are extension ladders safe to use? A: Yes, extension ladders are safe to use but you should always be sure to set them up properly. When they are not set in a safe position they can cause some serious accidents, even if you think that you’re not dangerously high at all. Before you use the ladder, make sure to look for any possible damage done to the rungs, the rung lock or pulley. It may seem that some flaws are minor but they can jeopardize the stability of the entire ladder. You should lock the ladder, move it so the shoe is safely on the ground and then extend it at the proper height. When you securely lock the ladder after extension, you can lower it to the structure and use it. It’s crucial that you climb using your both hands, carrying your tools in a belt, stepping on one rung at the time. Keep in mind that many accidents occur because people don’t take seriously all the precaution measures. Q: Can all extension ladders endure harsh weather conditions? A: Many extension ladders are made from durable materials that can endure all kind of harsh conditions, but not all of them can be easily left on the outside. If the product description doesn’t say it clearly, you should keep your ladder in a dry and safe place. Q: How to store ladders properly? A: Many users make that mistake and forget to store the ladders in their garages, leaving them outside where they are prone to harsh weather conditions. Some ladders are more resistant to bad weather conditions, but many of them aren’t. It’s not hard to store your ladders properly, you just need to get that habit. That way, you won’t only prolong a ladder’s life but you’ll also keep it safe for yourself – you want to avoid any accidental cuts on the rusty ladder. Firstly, you should find a storage place that is well-ventilated – store wood and fiberglass away from moisture, heat, and sunlight. Secondly, you should store stepladders vertically and closed to prevent any sagging that can make ladders unsafe for usage. Keep it from water, fire, radiators, steam pipes and other. Even more important, don’t use a ladder for storing other stuff in your garage. It’ll maybe save you some free space but your ladder will bend, and even the slightest damage can make it unsafe. Q: Can I build a ladder on my own? A: Of course you can! You can make a ladder for only a few bucks, it can only take more time if you don’t have the right tools and some woodworking experience. You’ll need two wooden boards and wooden rungs according to the size of your ladder. You should determine the height all by your own, just keep in mind that the rungs have to be on the same distance one from another. You’ll also need wood glue and deck screws to properly assemble all parts together. Keep in mind that you can’t make completely safe ladders that can be used at any height if you’re not a professional or working on your own. Therefore, you should use your homemade ladders for smaller tasks around your household and purchase a professionally made ladder for heavy-duty jobs. Q: Can I take the extension ladder apart? A: You can take an extension ladder apart and use two parts separately at your need. However, keep in mind that not all extension ladders are made to be broken apart. While some ladders can be divided into two parts and afterward connected together, some ladders can’t endure this separation and you could damage them. That way, they can become flimsy and unsafe for use. If you’re searching for a multipurpose extension ladder that you can break apart and connect later on, you should carefully read the product’s description and aim for the ladder that allows such separation. Q: Can I repair a ladder on my own? A: In most cases, ladders can’t be repaired in that way that they provide maximum security during use. People often can’t repair ladders good enough to fit the standard in which they’re made, so the best option is to take the ladders to a qualified professional. In some cases, just like with phones and new technology used in their design, it’s cheaper to replace the entire ladder than to replace parts of it. That’s where the expert steps in once again – you can find out whether is better for you to buy a new ladder or to replace and repair the damaged part.